1. A compatriot of yours, Jacques Delors, the former president of the European Commission, has said in recent days that the euro area is “on the brink of the abyss”. It’s a very pessimistic view, undoubtedly coloured by a sense of disappointment. Do you share it? I have great admiration for Jacques Delors. But let me sum up some of my present observations. First, we have a credible single currency which over the last 12 years has kept its value in terms of price stability in a remarkable way in comparison with the previous national currencies in the last 50 years. The solidity of the currency itself is not disputed and our fellow citizens all over Europe are calling on us to continue preserving price stability. Second, the euro area, taken as a whole, is in a better position from a fiscal standpoint than other economies. In 2011, the public finance deficit of the euro area should be around 4.5% of GDP, while in the United States or Japan it will be about 10% of GDP. But we had a very serious weakness in terms of economic and fiscal governance inside the euro area which has been revealed by the global crisis. 2. Well-informed politicians are not hesitating to talk about a possible break-up of the euro area. The weaknesses cannot be denied. The weaknesses have to be corrected. Loose fiscal policies and insufficient attention to competitive indicators have not been surveyed rigorously and corrected in time. Individually and collectively the European countries have to correct the present situation. Individually by adjusting their domestic policies – as all the advanced economies, including the US and Japan are called on to do – and collectively by considerably reinforcing their mutual surveillance and their governance. 3. On the subject of governance, there’s a discussion in various quarters about the possibility of creating European bonds. Former Italian Prime Minister Romano Prodi has proposed the creation of a fund guaranteed by the gold reserves of countries that would issue bonds to buy back national debt and make new investments. At this stage, we have the EFSF bonds, which are bonds with a European signature. The main message of the ECB Governing Council to governments is to implement rapidly, fully, comprehensively the decisions taken by the European heads of state and government on 21 July. 4. Are you talking about the decisions taken by the European Council in July, the ratification of which in some countries, such as Germany, is proceeding very slowly? I will not mention any particular country. All 17 countries are called upon to implement all the decisions taken by the heads of state and government. This comprehensive and quick implementation is important, including for the confidence of our fellow citizens. 5. So the idea of European bonds doesn’t attract you? Some people are convinced that in the current circumstances we need to consider the most innovative and ambitious solutions. As I already said, it’s important to note that the EFSF is financed through the issuance of bonds guaranteed by the European states. The Governing Council of the ECB considers that it is important that individual countries feel responsible for their own fiscal policies. At the same time, the Council judges it as essential that peer surveillance is conducted in the most rigorous way. Since the inception of the euro, we have called for a major strengthening of collegial governance. And long before the crisis, in 2004 and 2005, we defended the Stability and Growth Pact when it was attacked by the big countries of the euro area. The European Council, Commission and Parliament are working on the development of six draft secondary legislation texts to reinforce supervision of economic, fiscal and competitiveness policies. We are in the final stages of negotiations and I urge the parties to reach an agreement as quickly as possible. 6. A few weeks ago, in Aachen on the occasion of the Charlemagne Prize, you launched the idea of a finance minister for Europe. How realistic is this proposal? When do you think Europe can become a fully fledged federation? I said that not for tomorrow but perhaps for the day after tomorrow the European Union could be a confederation of a new type, not unlike the United States of America, but with a government of the confederation, including a finance minister. But this depends on our people. The people of Europe will decide what will be the future of their history. 7. Over the past ten years, the ECB has succeeded in maintaining price stability in the euro area. But low inflation has not been enough to avoid the turbulence of these years. In your view, is it enough to monitor inflation? Doesn’t the crisis perhaps show that, in addition to looking at the euro area as a whole, the ECB should also take greater account than it did in the recent past of economic developments in individual countries? First of all, as you know, the Treaty requires us to maintain price stability in the euro area as a whole, not to monitor the economic policies of different countries. This is the task of the Eurogroup and of the Commission according to the Treaty. And we have delivered price stability, which was our Treaty responsibility. But since the inception of the euro we have constantly asked the governments individually and collectively to live up to their responsibilities. As I said, we fought to defend the Stability and Growth Pact in 2005 when three main euro area countries wanted to water it down. And since then we have been giving the Eurogroup detailed information on the evolution of the competitiveness of member states and we are calling for rigorous monitoring of fiscal and economic policies. 8. In your opinion then, national governments are to blame for the current situation. Let’s talk about Italy. From your perspective, how do you judge the country’s efforts in the eight years of your presidency? The Italian economy has tremendous potential given the quality of its human resources and its corporate culture. And yet economic growth has been disappointing. For this reason, I believe in particular that structural reforms are necessary to increase the growth potential of an economy held back by too many obstacles – and they prevent it from achieving its full potential. 9. Italy has been the subject of intense market turmoil this summer. In this regard, how do you view the recent package of austerity measures proposed by the Italian government? These measures decided by the government in its announcement on 5 August are of extreme importance to rapidly reduce public finance deficits and enhance the flexibility of the Italian economy. It is therefore of the essence that the overall goal in terms of the public finance improvement that was announced be fully confirmed and substantiated. This is decisive to consolidate and reinforce the quality and the credibility of the Italian strategy and of the Italian signature. 10. And what about structural reforms? The serious situation in Italy, like the dramatic drifting in Greece, might it not be linked to an obsolete economic structure, not only to the high public debt? My message is clear: it is essential that all those measures that allow full exploitation of Italy’s medium and long-term economic potential are introduced. Today there is a huge potential that is not tapped as it should be. 11. The message that you sent to the Italian government in early August to urge it to take further restructuring measures has sparked controversy in Italy. Why this unusual decision? The view of the Governing Council was that the market turmoil at the beginning of the month required a message to be sent to the Italian government. We were seeing a progressive weakening of investor confidence and we felt it would be useful to share with the Italian authorities our thoughts on the most appropriate measures to help restore market confidence. 12. Some commentators have claimed that there was a quid pro quo: new consolidation measures in exchange for a launch of bond purchases in order to lower Italian bond yields. No. There was no negotiation. We sent our message based upon our analysis of the reasons for the market disruption. We analysed the decision taken by the government. Our decision to activate our Securities Markets Programme (SMP) is designed to help restore a better transmission of our monetary policy. Even in normal times all our decisions are very difficult. It is not by chance that you preserve price stability for 332 million fellow citizens over almost 13 years as we have done. Now we are experiencing a global crisis – the worst since the Second World War. And in these exceptionally demanding circumstances we had to take non-standard measures for monetary policy reasons. In particular, the decision to supply liquidity in full allotment mode and to purchase securities. 14. But the decision to buy bonds was particularly delicate because of criticism in Germany, worried by any form of debt monetisation, and because it exposed divisions in the Governing Council. Your detractors level an unfair accusation against you: they claim that you will be remembered as the President who caused the bank to lose its independence. I have just returned from the European Parliament and I can tell you that our decisions were commented on favourably by the members of Parliament, as all journalists could see. Having said that, the Governing Council acts very prudently, also in the use of non-standard measures, so as not to endanger the credibility and solidity of the ECB and of the Eurosystem. Bear in mind that since the crisis erupted in August 2007, our balance sheet has increased by around 77%, while the Federal Reserve’s has risen by 226%, and that of the Bank of England by 200%. In other words, the crisis has caused us to take a number of non-standard steps, but we took them cautiously and always with a view to ensuring a better transmission of monetary policy. Everybody knows as well that we are fiercely independent. The Governing Council has proved its independence through all its decisions and also through its firm and explicit messages to governments on all occasions. 15. 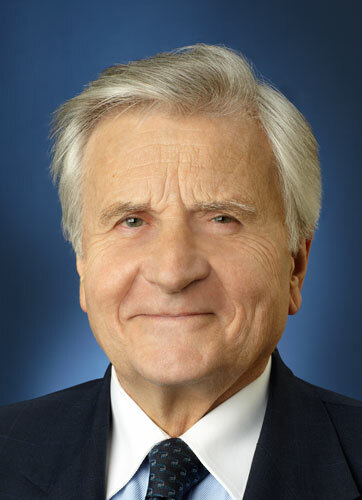 President Trichet, you will leave at the end of October after eight years as the head of the ECB. Mario Draghi, the governor of the Banca d’Italia, will replace you. How has the bank that you will pass on to him changed in recent years? Do you have any tips to give him? Mario Draghi has been a wise and strong member of the Governing Council for many years. He knows the institution extremely well and, of course, was a party to all the decisions we have taken. What matters is the permanence of the institution. I am certain that Mario Draghi will ensure the institution's continuity and credibility over the long term.